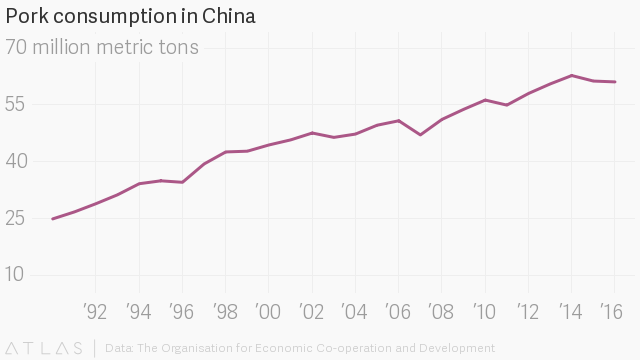 China, the world’s biggest pork consumer, is struggling with too much meat. The country devours millions of tons of pork every year and expects to own some 700 million hogs (link in Chinese) by the end of this year. But producers are cranking out more pork than consumers can handle. The “lean-type pork price index,” which reflects the nation’s pork spot price, was earlier this month down around 25% (paywall) compared to January. The index data, not freely available, comes from the agriculture ministry and Sublime China, a Shandong-based research firm that tracks China’s commodity markets. “The demand [for pork] has shown no obvious positive signs,” reads a June 20 report from Sublime (link in Chinese). Pork prices in China have long been volatile, in part because the market is dominated by small-scale farmers highly sensitive to swings. Ominously for the industry, though, the recent slide comes after consumption fell in both 2015 and 2016—the first two-year decline since the 1970s. 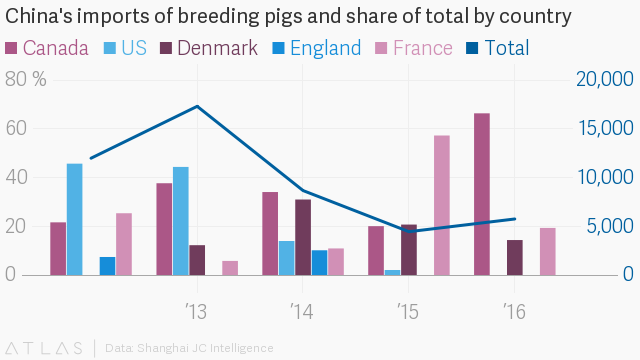 Their struggles are also reflected in the number of imported breeding pigs. Declining prices will continue for some time, many believe. Wan Long, chairman of China-based WH Group—the world’s largest pork producer—predicted last August that the downward trend would last for 15 months. But another trend should, perhaps, worry the nation’s pork producers more: Many Chinese consumers, prodded by the government, are shifting to more vegetables and less meat for health reasons.